Our facility was designed from the inception to be the safest, most relaxing, and labor efficient horse farm of it's kind. Every minute detail was carefully considered and extensively researched. 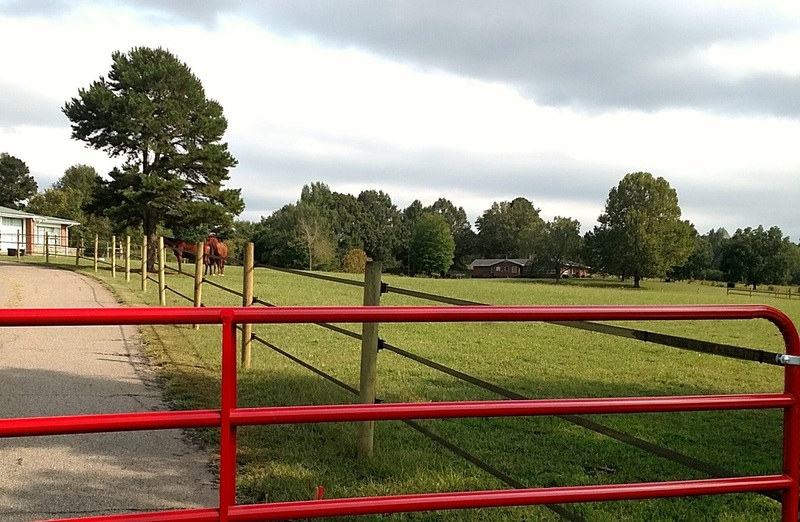 Whether you're noticing our paddock layout, or the tiny details like the latches to our gates, or even our choices in saddle racks, it's easy to see that this farm is special. 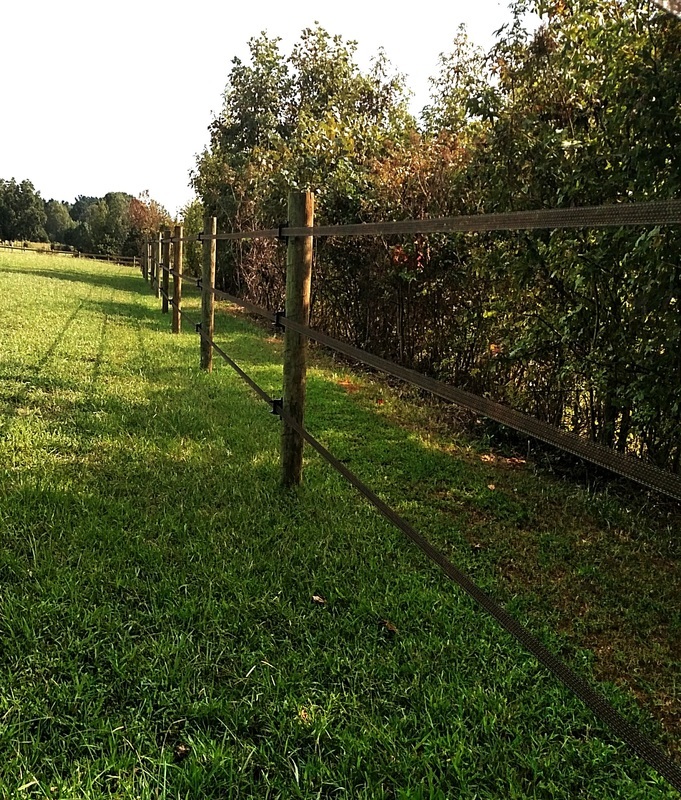 We proudly decided to use Horseguard Fencing products for our paddock construction. It is known for being the leader in containment safety with its high visibility, and lack of injury as a result of accidental entanglement. Our top rail height is 58" which is the recommended height for stallions, and our bottom rail is set at 21" to contain smaller visitors, and keep unwanted guests from entering. Road visible portions of our fencing are pressure treated 3 board fencing for a more robust and secure public image. These fence lines are reinforced with horse guard top rail on the interior. ​Security is of the utmost importance, and because of that we are a fully enclosed, gated facility. This means any time a horse is handled on the property they are safely contained even in the unlikely event of an escape or separation from their handler. Horses were designed to move. This is evidenced by how their circulatory system functions, which each hoof acting as a pump to deliver blood back to the heart, and even in their limitations in how long they can lie down without sustaining organ damage. Because of this our facility does not have a traditional barn. 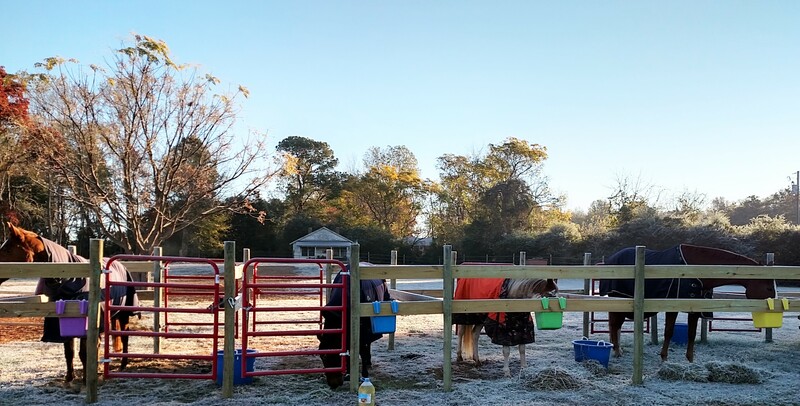 Horses are fed their daily ration of nutritional supplementation in private 8x12' outdoor feeding stalls, and provided shelter they can enter at will in the paddocks. Proprietary to our facility is our trailer loading stalls (far left 2 stalls)which offer the ability to teach horses to load in a stress free environment. The horse can explore the interior of the trailer at their own pace yet still be safely contained. 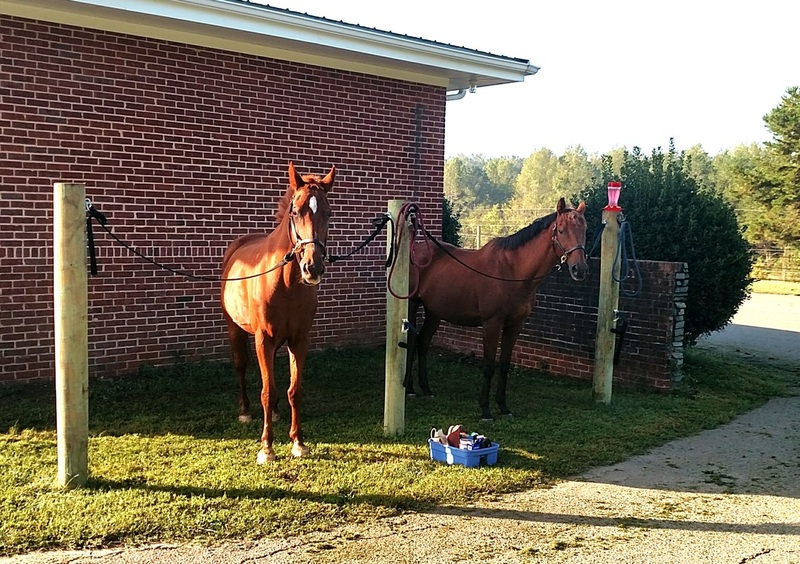 ​We proudly use Seminole Feed products for our resident horses, and include Equalizer ration balancer as an option for horses in training. Feeds are adjusted calorically through addition of alfalfa pellets, soaked beet pulp, and fats. All diets are formulated not to exceed 8% NSC, which aids in preventing many metabolic disorders and behavioral distress. 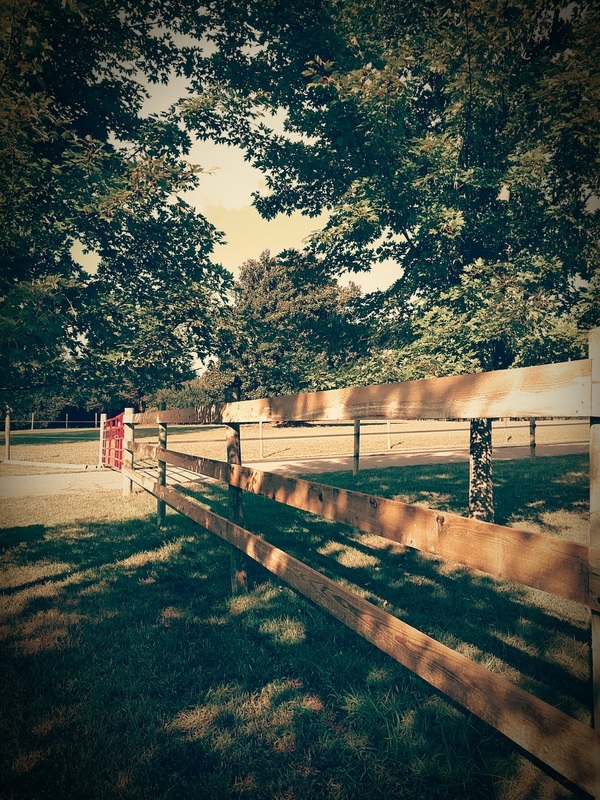 We have what we call an "organic dressage court" which is regulation large in length and nearly 40 meters wide with an established turf base with ideal grading for year round use. This is the ideal space for introducing a green horse to riding, jumping, or perfecting FEI level precision. A unique feature is our shade tree that occupies the southern portion of the court, and is the ideal place for observation on a sunny day. While turf arenas are less common in the USA, they are very popular in Europe as turf is a familiar footing to horses, and turf is less likely to create joint discomfort or soft tissue damage. Our latest luxury additions to the dressage court are 2 11' long by 6' tall mirrors so students can observe their equitation and their horse's posture in real time while riding, and 2000 LED watts of outdoor lighting. Our pasture management includes paddock rotation to prevent over grazing and limit intestinal parasites. Pastures are drug regularly to spread manure, virtually eliminate flying pests and offering natural fertilizer. 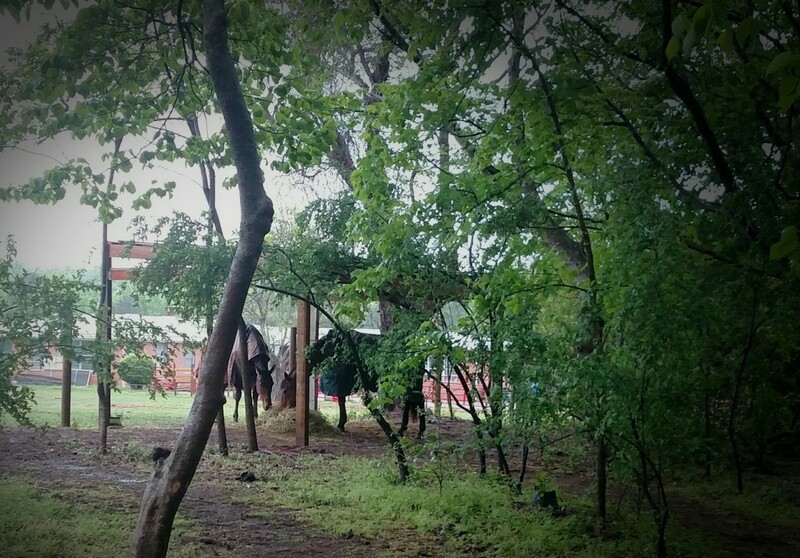 Horses will enjoy supervised entrance into our beautiful stocked pond. With a maximum depth of 5ft, horses can safely learn the fun of playing in the pond or crossing water. The pond is also an optional feature utilized in our training program. How many times have you heard someone say "we spent $$$$ on these run in sheds and the horses won't even use them!" It's because someone forgot to consult the most important client, the horse! We spent nearly the first year on our farm observing where the horses preferred to nap and seek refuge from the elements, and experimented with temporary shelters before constructing permanent ones. We also didn't want to have the structure detracting from the natural beauty of the facility so you'll find our shelters nestled into their surroundings. We work with local growers to get the very best supplemental hay that is stored properly sheltered from the time it is baled, to the time it is fed. The 100% alfalfa round bales are the resident favorite of Hondo and Beefy, and are fed during the dormant grass months in a slow feeder net to help simulate natural grazing and keep a constant supply of forage digesting. We also have available for horses that are easier keepers, or allergic to alfalfa the option of high quality fescue round bales. If your horse is attending training during dormant grass months and has an alfalfa allergy, please let us know at the time of your booking, so we can be appropriately stocked. 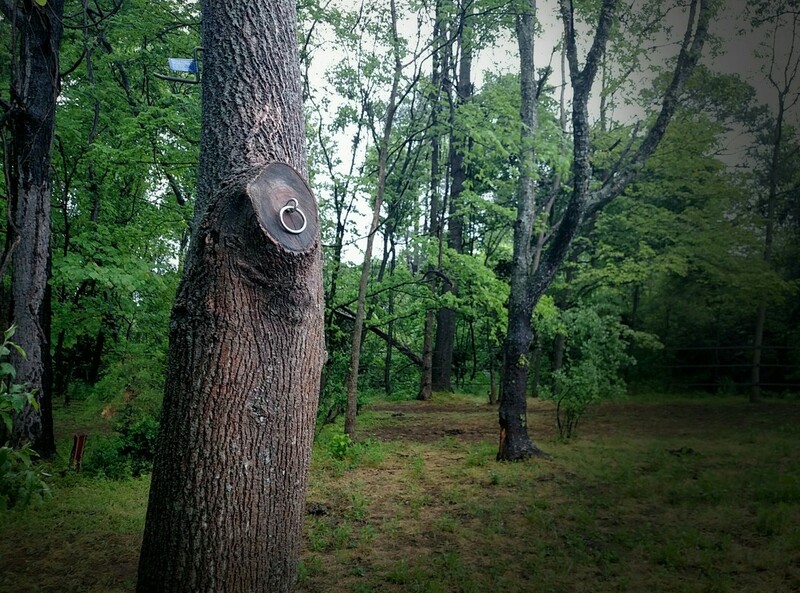 You'll find several trees on the property with O rings attached about 7ft off the ground. No, these are not for tying horses, but rather for tying up slow feeder nets of supplemental hay. Jaime Jackson had some great ideas when it came to creating movement for horses in turnout, but the labyrinth of temporary fencing not only makes it costly and difficult to maintain with farm equipment, but also dangerous for horses should a predator make it's way into their enclosure. Our hay stations create the same incentive for movement and exploration without the drawbacks of paddock paradise. 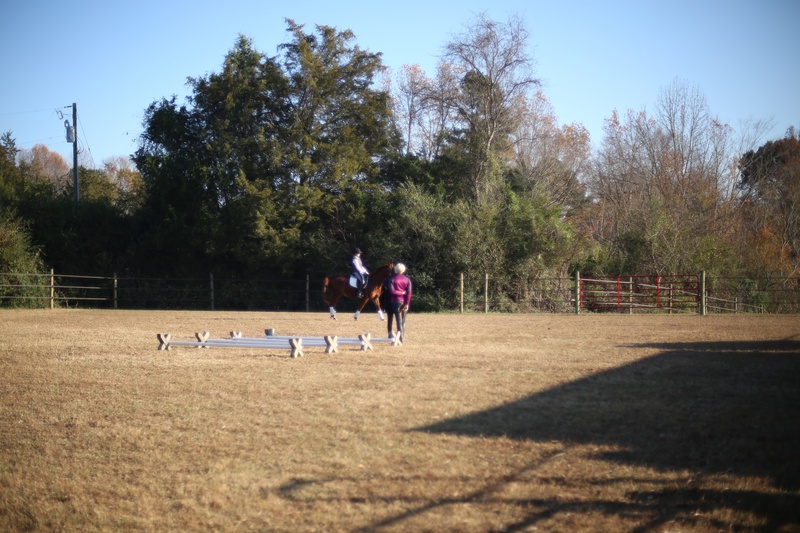 Our trails are groomed and have options for riding in all 3 gaits, with more meandering walk paths, to a figure eight trot loop, and a canter circle. In the summers, this shady hardwood oasis is a fantastic space for schooling, and trail practice.